I recently decided to set my alarm clock to wake me up when it is "dark" out. In the end, I decided to set my clock to the earliest time that nautical sunrise is in my state (Illinois) and stick with that all year. Why would twilight be longer in summer than winter? Before seeing this data, I had assumed that since the sun makes a more perpendicular path through the horizon in summer that twilight would be shorter in summer than in winter. After all, in winter the sun takes a "slanted" path across the horizon. Wouldn't the summer's path be more direct and therefore quicker? OK: seeing this empirical evidence I conclude that something is wrong with my premise that forms my first question. Summer twilight is longer in summer than winter. However, I still would have assumed that March 20 would have had a twilight length in between the two solstices. But it's not! Why does the equinox have the shortest twilight? I didn't want to leave my original incorrect statement in here without flagging it. As Cheekhu points out below, the sun does not follow a more perpendicular path in summer than winter, as I had erroneously assumed and stated above. See his post for more details. Now, the slant appears to be the same for June and December Solstices, doesn't it? First thing, it is a wrong conception that Sun travels more "perpendicular" to horizon in the summers. It just reaches a higher point as you can see, not that the slant is more. Where does the disparity come in? Civil Sunrise begins when the Sun is 6° below the horizon, Nautical Sunrise begins when it is 12° below the horizon and 18° for Astronomical Sunrise. So, the Civil/Astronomical Disparity is due to the extra 12° of altitude that the Sun has to cover. Now, the diagram I have posted is better to explain the sunset, so let it be that way. It is just the same for our purpose. The motion of the sun is uniform along the circles that you see. But these angles which decide our sunrise are measured perpendicular to the horizon, from the zenith. Are you aware of what happens when you project circular motion along a straight line? That's right. You get a sinusoidal curve. The special thing about this curve is that it changes fast at some points and slow at others. Transit is the position when the Sun is highest in the sky. In the curve for equinox (as in Fig 1), if you assign 0° to that point, the Sun is at 90° at sunset and -90° at sunrise. Both positions give you the peak of a sine curve and the change is lowest at that point. That might explain why you get the least difference at Equinox. Now, if you consider the curves for June/December solstice (as in Fig 1), the position for sunset/sunrise is a little off 90°, hence rate of change is faster there as compared to the equinox. That should explain why the disparity is larger at solstices as compared to equinox. But what about the difference in June and Decemeber solstice? Now, my dear, you are entering dangerous territories. Let me remind you that the line/plane along which we are making our degree measurements is perpendicular to horizon. But the plane of circular motion is still at an angle to it. So, the sinusoidal curve has to go through another set of projections before you get the exact thing. On Equator, the disparity between the solstices vanish, yes, as the aforementioned two planes align. $\delta$ is declination of Sun on that date. Google it. To get the disparity, you need to find $H$ from the formula for two values of $a$ and get their difference. Remember to divide by 15 to convert from degrees to hours. I have a friend who is an astronomy professor. I pointed him to this post and he shared an answer I'll post on his behalf in case it's helpful to others. His comment here references the first diagram posted by Cheeku. An easier way to see this is to look at the circles that the Sun makes at different declinations (angles north or south of the equator). The biggest circle is when the Sun is at the celestial equator, which corresponds to the equinoxes. Since the Sun needs to complete its circle in 24 hours regardless of how big the circle is, the Sun's daily motion will be fastest near the equinoxes and so twilight will be the shortest then. Comparing the two solstices, the main difference is that in summer the Sun doesn't get that far below the horizon before it turns around and starts to rise. Its vertical motion at night is thus very slow. That makes the twilight longest in the summer. Not the answer you're looking for? Browse other questions tagged the-sun light rotation atmosphere or ask your own question. 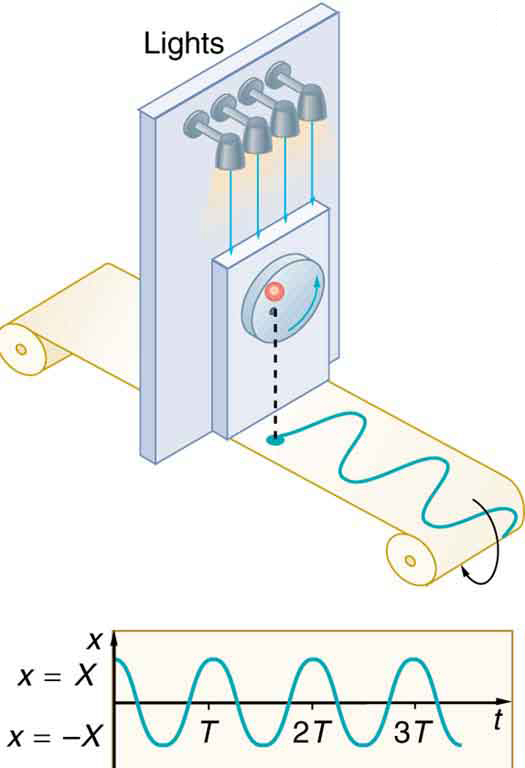 Can someone explain me this diagram from an article? 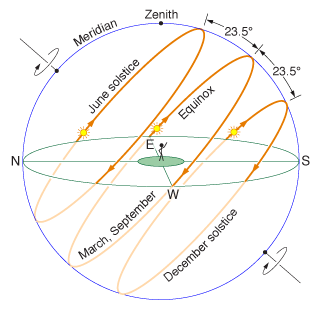 Why does the sun rise north of east between the vernal and autumnal equinox? On the Equator, why are the shortest shadows seen at 11:32, and not at Noon?